Mountains and jungles are separating the Caribbean and the Amazonas region. Geographer Alexander von Humboldt had tried to find a place suitable for a waterway between Orinoco and Amazonas. In reality during the railway age the liberated coastal states were not connected with Brazil, neither they were interconnected by rail. 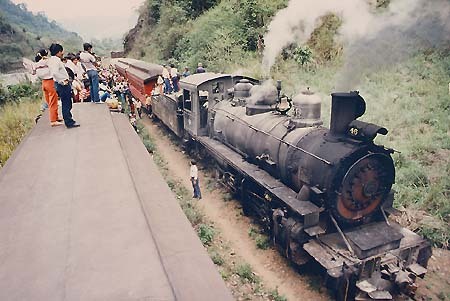 The passenger from Europe, from Lisbon, from the Sud-Express, could disembark at La Guaira, Venezuela, and take the 3ft gauge steam train up to the capital Caracas. A British enterprise built the line in 1883 and from 1927 electric and then also light diesel railcars were in use. 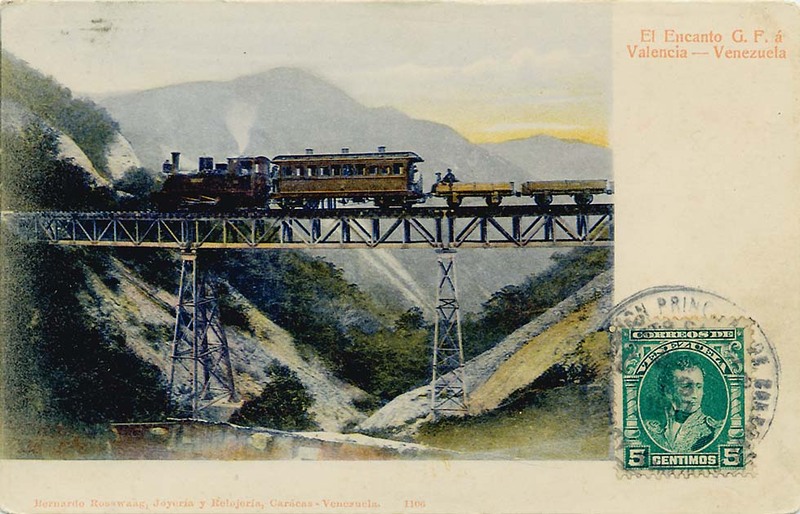 A brochure from the '30s informed: "A most convenient and rapid service is now offered by the La Guaira and Caracas Railway as passenger trains leave both towns every hour. The route, which starts from the railway station at the docks in La Guaira, follows the shore for two kilometers to Maiquetia, a small sea-side resort, and then begins to climb on a gradient varying between 3 per cent and 4 per cent, until at kilometer 33 it reaches a height of 3105 feet (946 meters) above sea level, after making many turns and twists…. On the trip one enjoys imposing mountain scenery, and a magnificent view of the sea is to be had at all points of the line between La Guaira and Boqueron, from which place one sees the horizon at about 65 miles". Form 1894 the passenger could continue by the "Rapido" of the Gran Ferrocarril de Venezuela, a Krupp enterprise, to Valencia. In the '50s however, a spectacular super-highway, called "Panamericana", replaced the La Guaira and Caracas railway and also the various Cape gauge lines disappeared. At the same time a standard gauge mining railway Barquisimeto - Puerto Cabello was built. There are plans to connect it with mining lines on the Orinoco and even an electric railway between Caracas and its airport near Maiquetia became a dream. Behind the table mountains of the Gran Sabana are hidden the Guyanas. British Guiana had a standard gauge line from Georgetown eastward and a Cape gauge westward. In formerly Dutch Surinam the last railcars still in the '80 were running on a section of the Paramaribo - Brownsweg narrow gauge. In Guyane Française a tiny 0.60 m gauge railroad connected Saint-Nazaire on le Tigre river with Saint-Elie. In Colombia one of the oldest railways was the line from the Caribbean harbor Cartagena to Calamar on the navigable Rio Magdalena. A short railway La Dorada - Honda circumvented rapids and in 1909 a line from Factativa connected the river with the capital Bogota. Only in the '60s Bogota got a direct 3ft-gauge link with Santa Marta on the Caribbean. In the '70s passengers were fascinated at Bogota by a streamliner-like new train with a sort of round-end observation car, sporting the name Expreso del Sol. 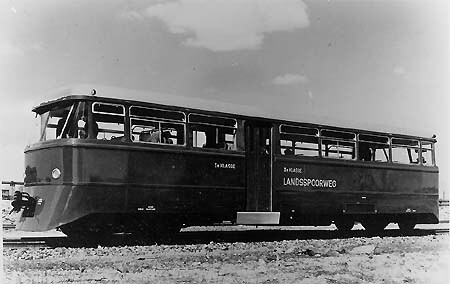 It was diesel-hauled and the lightweight cars had been built in Cali. Cook's timetable described it as a seasonal "Lux" Tayrona, running from Bogota to Santa Marta with sleeper, diner, 1st class coaches and motorcar transport. 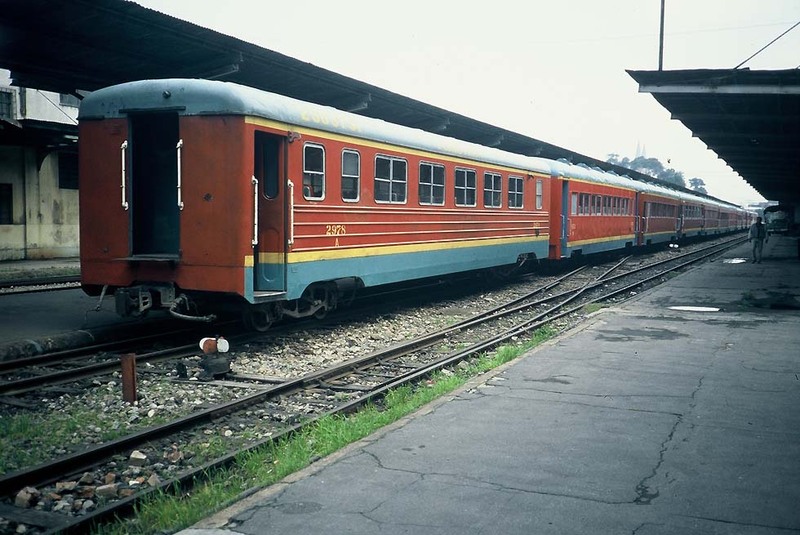 In the '80s there were also cars Medellin - Santa Marta and on weekends the red train was used for day excursions, headed by a black/green Baldwin Mikado. 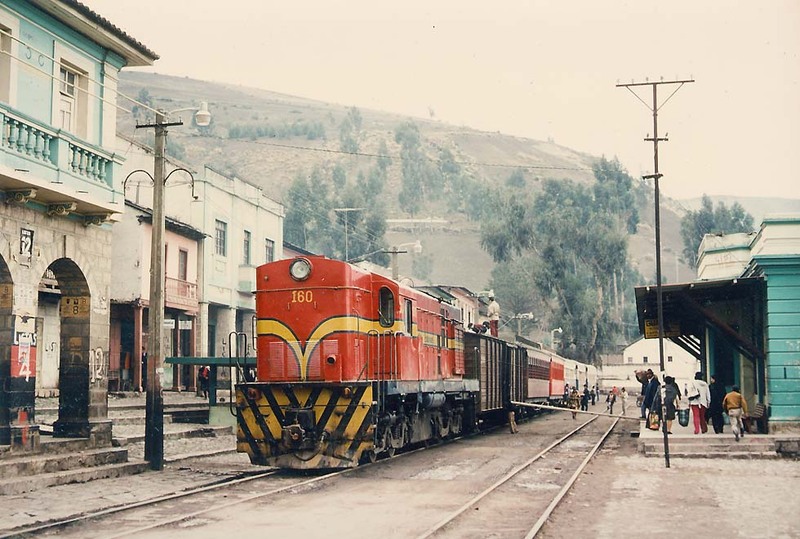 Around 1990 the Ferrocarriles Nacionales de Colombia were bankrupt, train services stopped, but during a visit in 1996 the boss invited to see the Bogota locomotive shed, where Baldwin Mikados and the red cars still waited for an occasional "Turistren" ride. Ecuador had its picturesque capital Quito conncected with Guayaquil on the Pacific by Cape gauge, built between 1871 (initially 3ft gauge) and 1908. Ocean passengers at Guayaquil traveled by boat to nearby Duran, where the wooden coaches waited. Still in the '90s small Baldwins headed the divided "mixto" over the zigzags past the Devil's Nose over 5.5 percent gradients up to an altitude of 3239 m. Only the "Autoferro" railcar allowed the travel without overnight stop. Diesels from France and USA replaced steam. In 2005 Cook mentioned a local "Tourismo" as the only passenger train at Quito, but tourist agencies announced a railbus from Quito to the Devil's Nose and Alausi. On the northern line to the harbor San Lorenzo, opened in 1957, an "Autoferro" railbus may run from Ibarra, when fuel is available. "Lujo" Bogota-Santa Marta, FNC 3ft-gauge, consist at a rough guess around 1980: Diesel, generator van, diner, sleeper, c. 3 1st class coaches, observation car (Colors: red, yellow stripe).